Broken Head Beach wedding for Rachel and Penny with a difference! Another stunning beach wedding- with a difference! Rachel is an Intensive Care doctor. Penny had a long career as an Ambulance Paramedic before swapping to Nursing. They had a ceremony back in 2011 and have considered themselves married since then. They had already made their promises, exchanged vows, rings, and pledged their love to each other. However, it was not legal in Australia in 2011 for 2 women or 2 men to be legally married. They (and many others) had to wait for marriage equality to happen. They finally tied the knot (figuratively and literally- with a hand fasting ceremony!). It was a very special moment for them- and might I say their lucky celebrant! They had a beach wedding and had their commitment recognised as legal, finally. A beautiful ceremony with just myself and their 2 dear friends acting as their witnesses. Truly intimate, from-the-heart, and inspiring. Rachel and Penny used the same ceremony content that they had written 7 years prior. I must say it was truly beautifully written. Broken Head Beach is just south of Byron Bay. It is a stunning spot to have a ceremony- as is every place here in the gorgeous Northern Rivers! This was the first wedding ceremony I have attended that had no photographer. I helped them tie their Go-Pro to a nearby tree to capture the ceremony! Congratulations Rachel and Penny. Seeing the two of you so happy is a memory I will never forget, and I am so humbled that I got to be your celebrant. 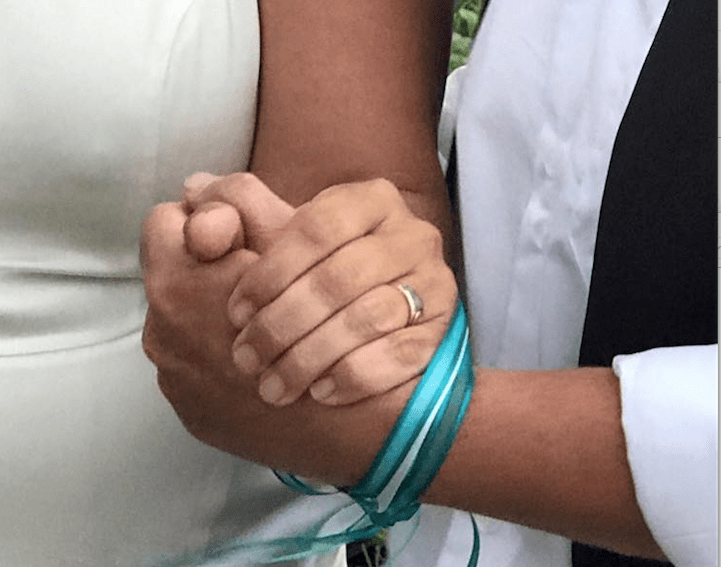 If you are considering a hand-fasting ceremony, to literally ‘tie the knot’ with your future spouse, get in touch with me to see how I can help!